In standard Sokoban, you move the Sokoban one cell at a time. Pushing the piece a long way requires boring continuous keypresses. Expert Sokoban is a Sokoban game aimed at advanced players: Pushing a single piece to a given destination cell is considered a trivial enough task that it doesn't add to the value of the gameplay. You must apply logic for it is a bit of a puzzle at first. You have limited space in which to push the boxes around the maze so you must choose carefully. Like all the best classics, it gets totally addictive! It is easy to while hours away enjoying this simple game. It gets challenging though! Thus, in Expert Sokoban you simply select a piece and then select where you want it moved. The game figures out the shortest path instantly. It may seem at first that this takes the fun out of the game, but actually the primary challenge in a difficult level is to work out a sequence of moves and pushes that leads to a solution. The game is more enjoyable for you as an expert if you can concentrate on the essence of the level. So don't be surprised that you can't move the Sokoban by pressing the arrow keys – instead click on the pieces! 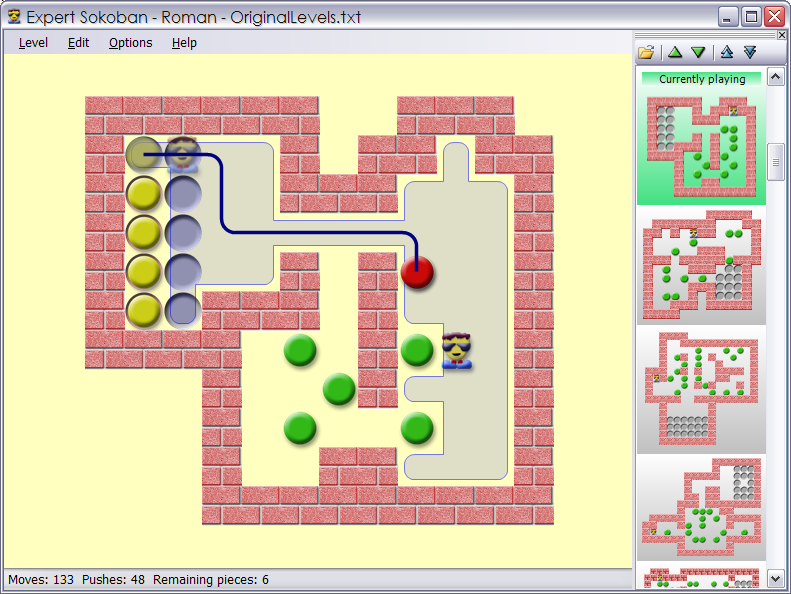 Expert Sokoban was developed by Timwi and Roman.